NEW! Surf-ACE P-15 XTRA 1 Litre Concept has done it again with its innovative Surf-ACE brand. Several years of concentrated development and testing has yielded yet another world-first product in P-15 XTRA. Early trials in strenuous real-world scenarios have received nothing but praise for the product! 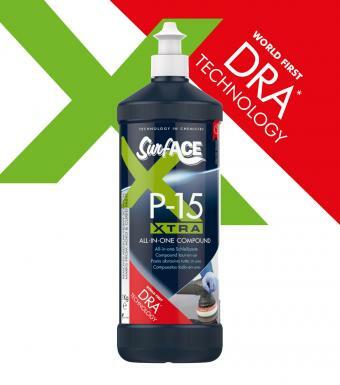 Now ready to be launched to the world at this years forthcoming 2018 Automechanika Frankfurt, NEW P-15 XTRA with unique DRA™ (Dynamic Response Abrasion) technology incorporating micro-precision oxides, easily removes imperfections, scratches, swirls and oxidation from all finishes including scratch-resistant, UV-cured and aged paints in the shortest possible time. P-15 XTRA benefits from a lubrication system which can be worked for prolonged periods without drying out. Fast cutting compound Can be worked for longer Mirror-like high gloss finish Does not contain fillers Guaranteed minimal drop back or bleed back Quick and easy clean-up Use on all automotive paint types P-15 XTRA is the ideal polishing compound to prep all types of paint coatings including prior to quartz and ceramic coating (glass coating). Using pads you can compound and glaze with just one product!